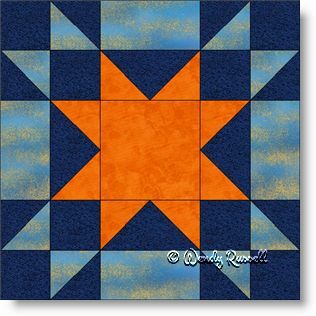 The Amish Star uses simple patches to make this easy quilt block. It features squares, rectangles, half square triangles and flying geese units -- all patches you learn as you begin your quiltmaking journey. This is a six patch block (as it is designed on a 6 x 6 grid) that is constructed in "chunks" as a nine patch. The centre of the block is actually another pieced block called the Sawtooth Star. The two sample quilts illustrated are both set on point but with subtle differences -- one uses pieced blocks to cover the complete quilt, with added sashing strips to separate the blocks, while the other quilt features blank blocks to showcase your quilting skills. What will you choose as the setting for your quilt -- one of these or something you design?